The Writer's Challenge: Stephen King's "On Writing"
Yesterday I met my goal of putting all of my revisions for my romance novel into the computer - all 203 pages of them! Now I will have a nice clean copy for when I start my writing class next Wednesday. My husband has never actually read the novel I wrote so I asked him to read it this weekend and let me know if I am going to be making a fool of myself bringing it to this Advanced Writing Workshop. I doubt I can get an unbiased opinion from him, but that's okay - sometimes I just need a cheerleader. Other times I need honest-to-goodness critique, which I will hopefully get at the writing class. So what happened to writing 1000 words a day, you ask? Here we go: it starts TODAY!! My goal today is to start writing a new novel. I am thinking of doing a historical romance, since I love to read historical romances. I've shied away from that in the past since I'm terrified of making a mistake, but that's what research is for, right? Plus, since I've read probably a hundred of them, I already have a pretty good idea of what times were like for the Dukes and Duchesses in England. I think. We'll see, I guess. The reason I love historical romance is that the time period creates some really fun story elements that simply don't exist in modern romances: arranged marriages, pirates, castles, archaic laws, etc. But now, even just writing about starting writing, I am getting a bit freaked out. The thought of the research involved is once again scaring me. Well, we'll see how it turns out. I'll let you know tomorrow. 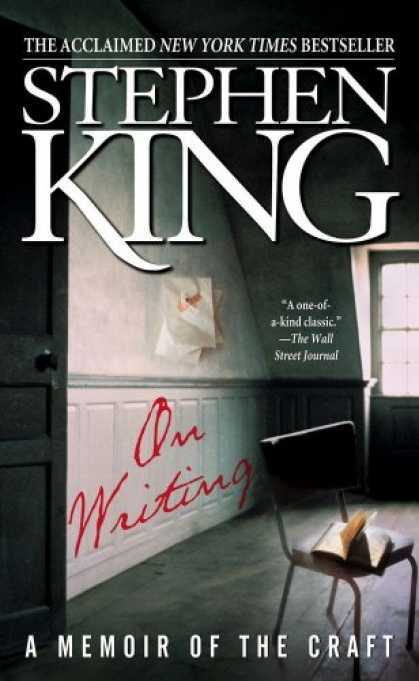 I would like to review another one of my favorite writing books: Stephen King's "On Writing: A Memoir of the Craft". Stephen King writes 2000 words a day, every day. He says in the book that he used to tell reporters that he wrote everyday except his birthday and Christmas, but that it wasn't really true - he wrote on his birthday and Christmas as well. He can write a 180,000 word book in like three months. Unbelievable. It was King's idea to write at least 1000 words every day, and I would like to take his advice. Of course, I have an infant who may or may not let me get much done, but he does take naps so there you go. I just need to use my time wisely and not procrastinate. Another lesson I learned from King is that persistence pays off. He started writing as a kid, and by the time he was a teenager he was regularly submitting his short horror stories to magazines. The magazines would reject him, and he would just take that rejection letter, hang it up on a nail in his room, and keep submitting stories. He got so many rejections he had to replace the nail with a spike, and he filled that up with rejections too. But he kept going, because he loved writing and he wanted to share what he had written with others. And here I am, with exactly two form rejection letters to my name (from agents) and I just gave up completely. I really want to gain the confidence in my writing to keep collecting those rejections until I get somewhere. Thanks for reading. Wish me luck today (I'm going to need it!) and good luck to you too! Go for it Baby, have no fear... If anyone can do this it's you. You eat 1000 words for breakfast... you were meant for this!